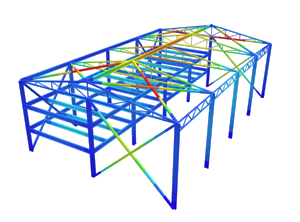 SkyCiv Cloud Structural Analysis Software – How to Calculate Shear Force Diagrams? 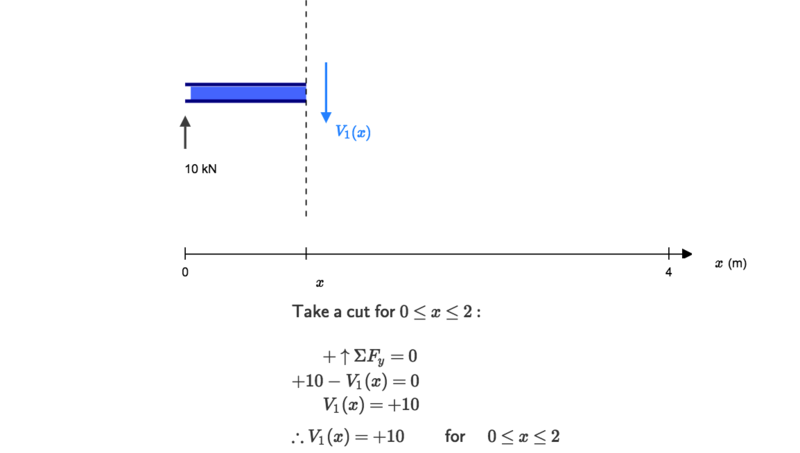 In this tutorial, we will look at calculating the shear force diagram of a simple beam. This is an important concept to understand, as shear force is something a beam will need to be checked for, for a safe design. Firstly, what is a shear force? A shearing force occurs when a perpendicular force is applied to static material (in this case a beam). Think of a knife cutting through a carrot. Imagine the beam is the carrot and a point load is the knife. As the knife applies a downward force, it cuts (or shears) the carrot. These forces occur along numerous points of a beam, and it is important to determine where these shears are at the greatest points as this may be where a beam fails. If there is an upward force (i.e a support) then the SFD will start at this force above the x-axis. If there is a downward point load and no support than the shear force diagram will start as a negative at the value of the point load. As you come across loads, you simply add (or subtract) these loads from the value you already have, keeping a cumulative total. Keep moving across the beam, stopping at every load that acts on the beam. 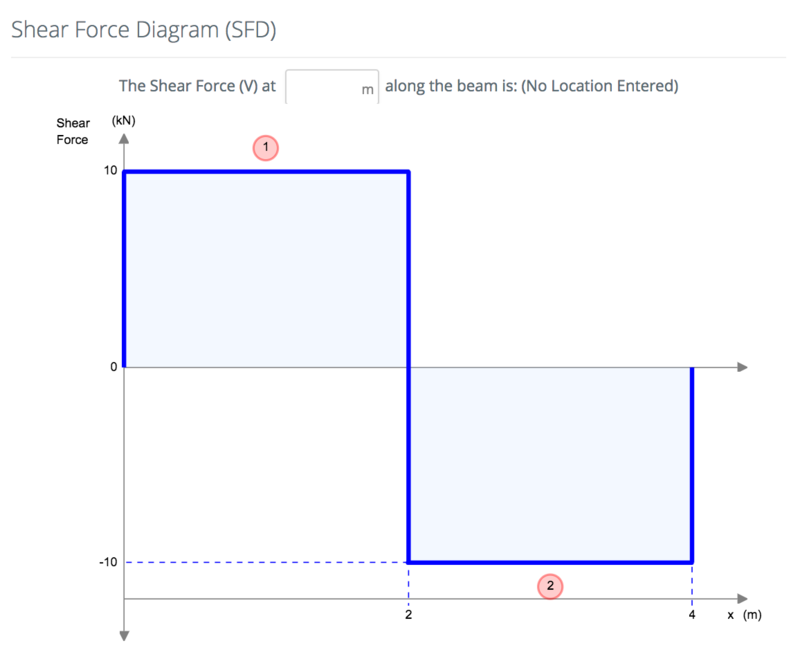 When you get to a load, add to the Shear Force Diagram by the amount of the force. In this case we have come to a negative 20kN force, so we will minus 20kN from the existing 10kN. i.e. 10kN – 20kN = -10kN. The area under the SFD above the x axis should equal the area between the x-axis and the SFD below the x axis. i.e the area should sum to zero. Check this is true in our above example. 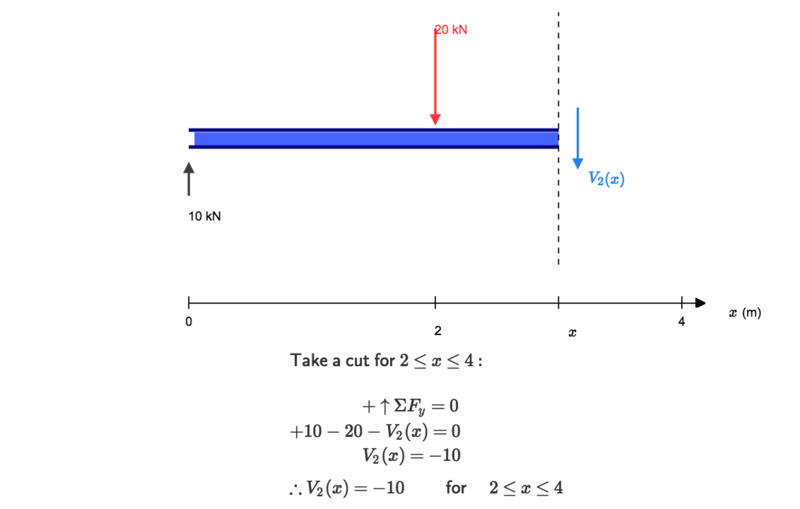 Visit the next step: How to calculate Bending Moment Diagrams of Simply Supported Beams.